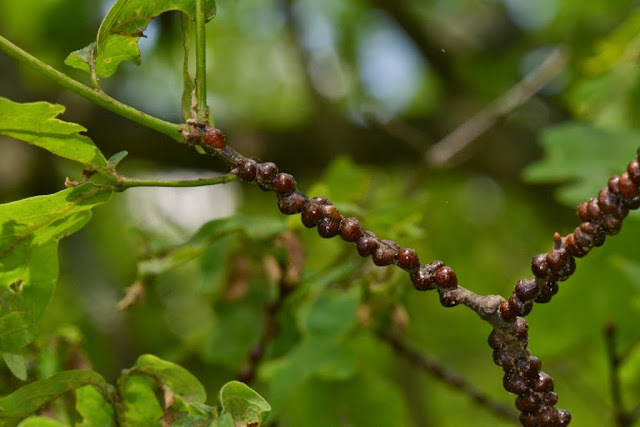 Vast hordes of Oak lecanium scale insects have encamped on oak tree branches in some areas of our oak forest. Although the scale insects are fascinating, even more interesting for me is observing the scale's enemies at work as natural biological control agents.... busy busting up the bivouac on the branches. See all those brown lumps crowded there on the small branches of an oak tree? Those oak lecanium scale insects are the honeydew rain-makers I wrote about in my last post. 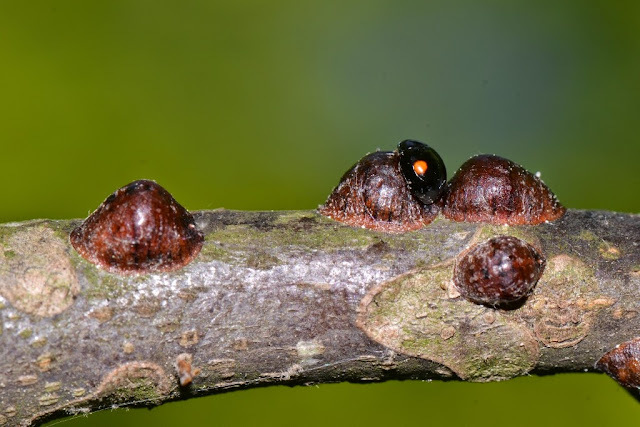 This spring these scale insects have been busily feeding on the tree's sap and dropping honeydew droplets over everything on the forest floor. Here is a photo of the oak lecanium scale, warty and blister-like, on some oak branches. 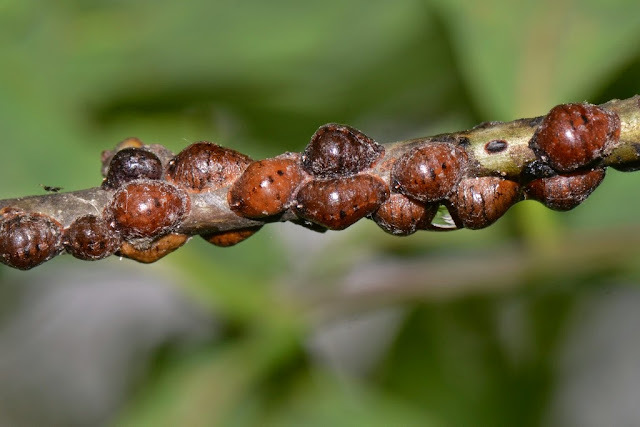 Scale insects do not look very much like insects, do they? They would pass for small bumps on the branches, or small galls, or even some kind of fungus rather than insects. If you look very close, the scale insects look like tiny turtles shells. With a little imagination you can see they are insects. ... perhaps those white things are retractable antennae? I flipped over a scale insect to show its underside. It is not much to see, but the underside does look more insect-like than their nondescript shield-like topside. 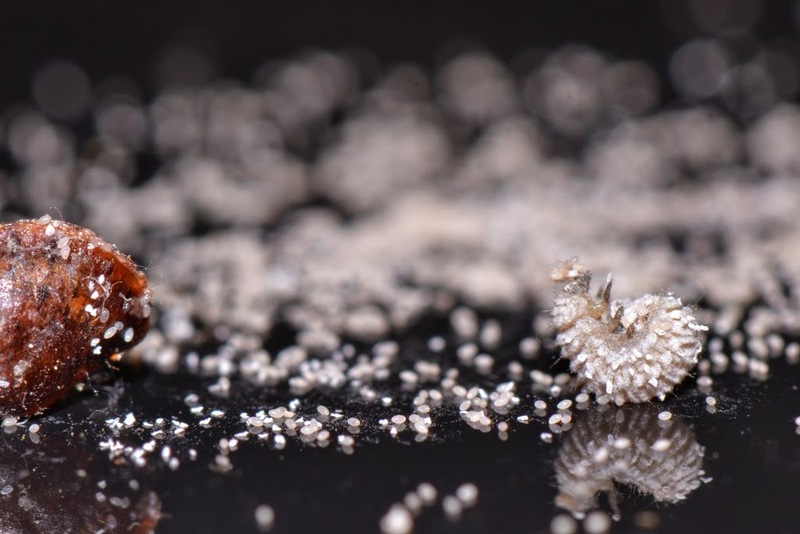 Yes, those are scale insect eggs. Want to count them? Could there be more than a thousand there? 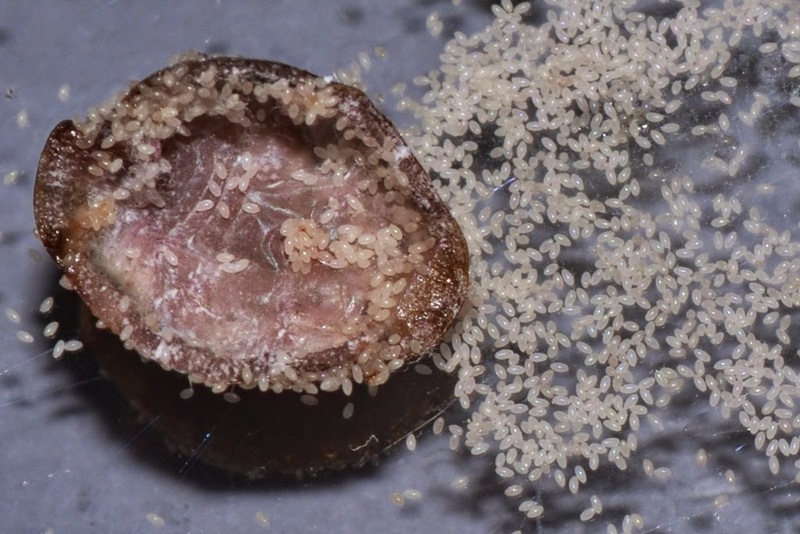 All of the eggs pictured below are from one scale insect! Each time I peeled off one of those mature scales, I watched incredulously as a cascade of eggs poured out from beneath the tiny scale. I thought to myself, "Just wait until all those eggs hatch!" Would you like to see something even more incredible than such a vast amount of eggs? On about every third branch, or so, I could see some tiny parasitoid wasps laying eggs on the scale insects. 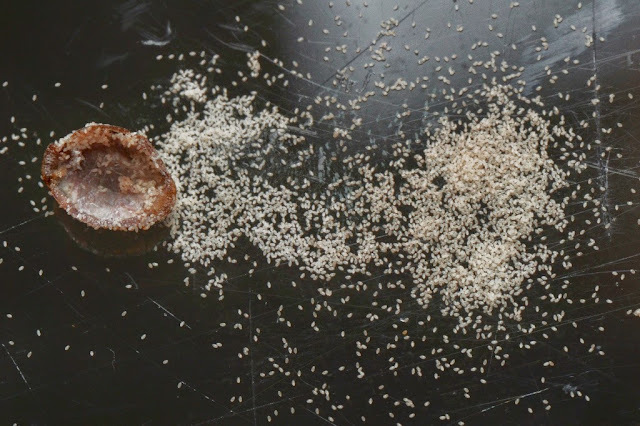 These wasps are biological control agents aligned against the scale insects. They are charged with a daunting task, eh? Now that is incredible! To see such a tiny wasp, barely bigger than a flea, working to biologically control this massive scale insect population. You go little wasps! Here is another photo of a parasitoid wasp on an oak scale insect. 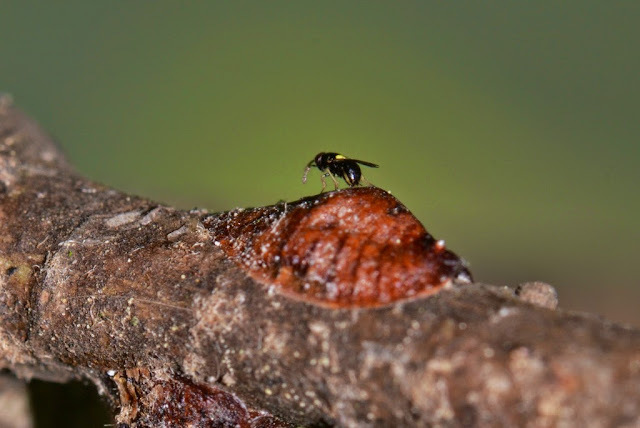 I took the photo on another day... on another mountain... and I saw several of these extremely tiny wasps working at laying eggs while I was on my knees with my face among the branches of an oak sapling. To me, that means there are many, many of these parasitic wasps working as bio-control agents. Yay, that makes my day! 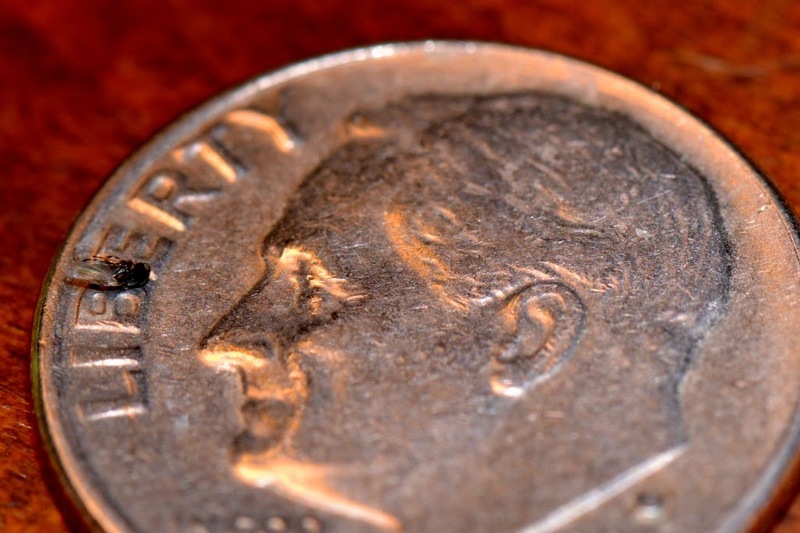 Here is a photo showing one of the wasps on a dime... its not much bigger than the "b" in Liberty. 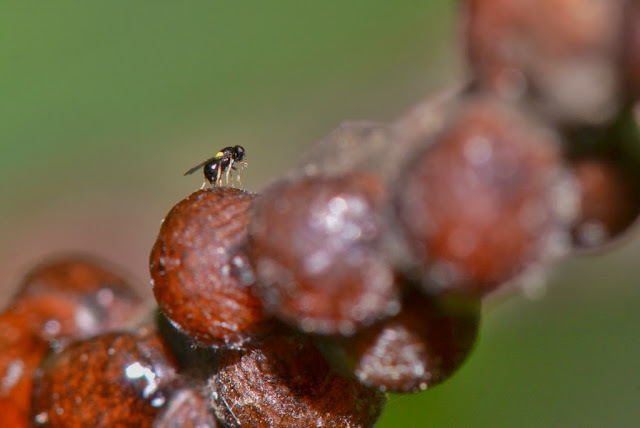 There were a few species of these tiny wasps actively laying eggs on the scale insects. Here is a close-up photo of one of the minute wasps I found crawling among the Oak lecanium scales. 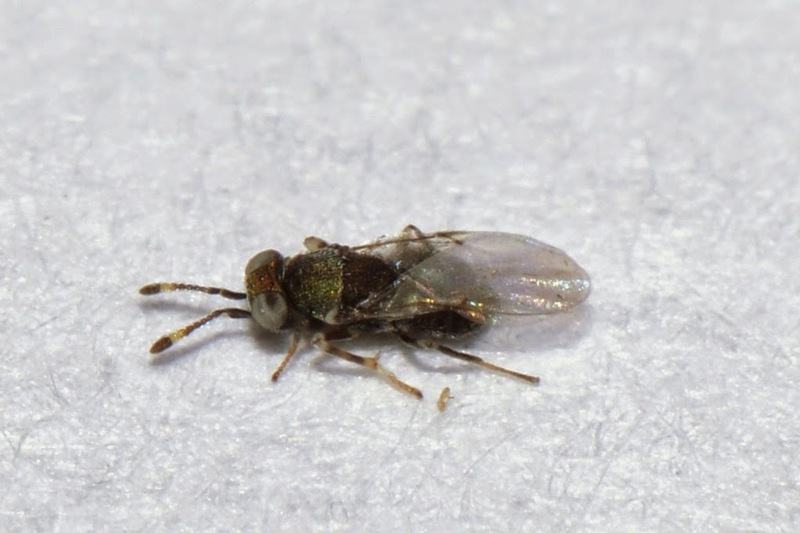 These little wasps aren't alone in their battle against the Oak lecanium scale insects. Here are some other natural enemies of the scales that have joined the battle. This is a fairly large lady beetle larvae. I saw numerous lady beetle larvae as well as pupae on the trees where the scales were plentiful. Here is possibly another enemy of the scales. This small, two-spotted black lady beetle is, perhaps, one of the Hyperaspis species. I noticed a number of these black-colored lady beetles crawling on the Oak lecanium scales. 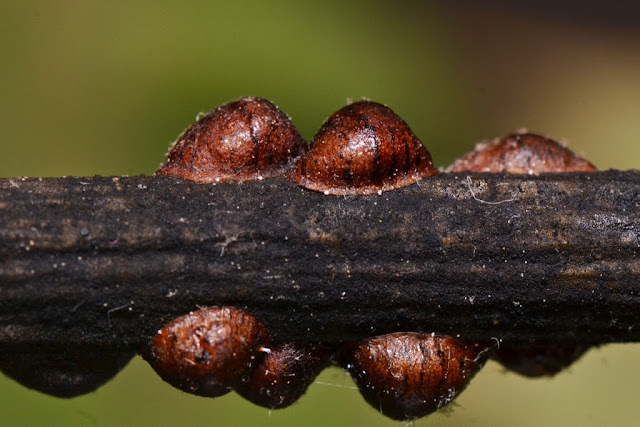 I assume their larvae prey on the scale insect eggs... see below. 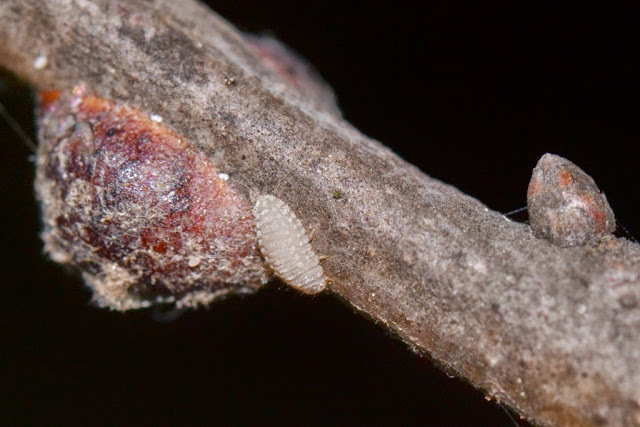 I also observed some light-colored larvae that were covered with downy white wax crawling among the scale insects. Some of the beetle larvae had a powder-coat of wax while others were rather hairy with wax tufts. 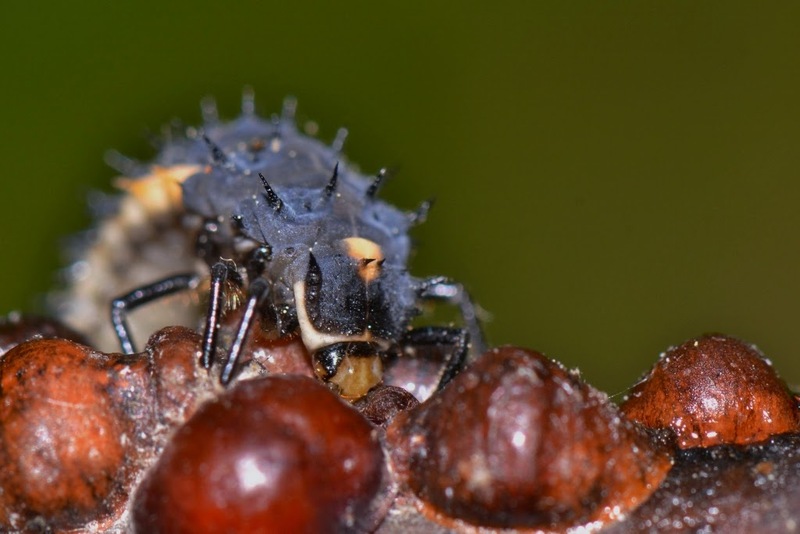 I believe these are larvae of lady beetles similar to the adult lady beetle in the photo above. 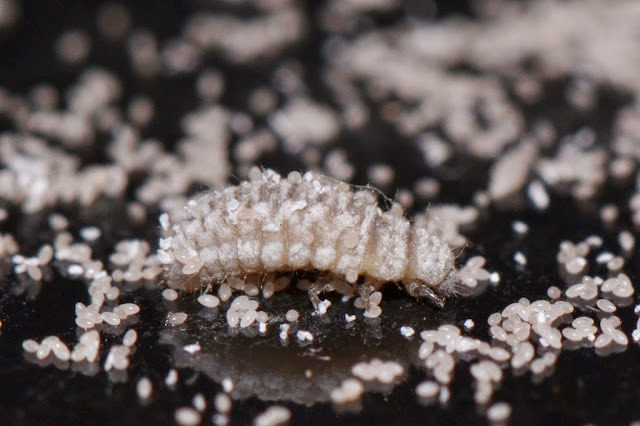 As I was peeling off some scale insects, I occasionally found some wax-covered beetle larvae living beneath the scales. Obviously these larvae were feeding on the scale insect eggs. I poured out the eggs of one scale and this little white larva tumbled out with the eggs. Again, I suspect it is a larva from the ladybird beetle family probably Hyperaspis sp. 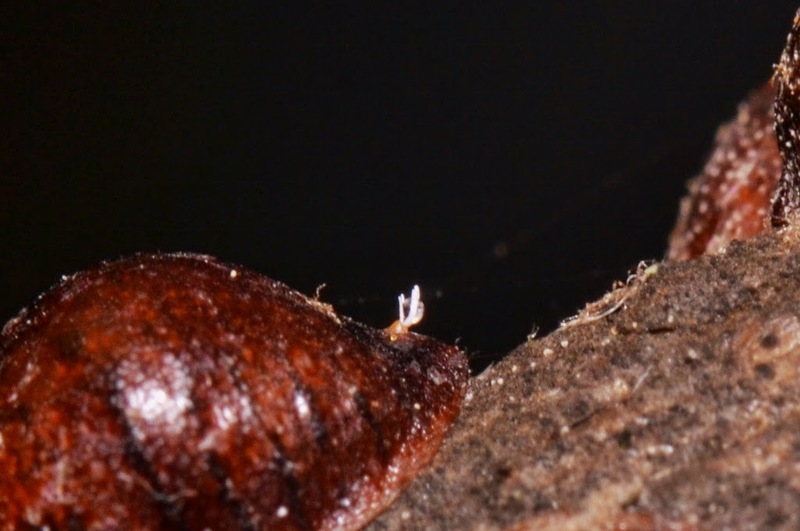 Notice how the larva has the beginnings of tufts of white wax. Here is the same larva in a different position. I saw more biological control agents busy battling the scale insect infestation. For example, I saw some very small syrphid flies dive-bombing the scale insects. They would hover nearby then drop in for a quick contact -- which I assumed was to deposit an egg. The honey-dew rain is almost over... for now. 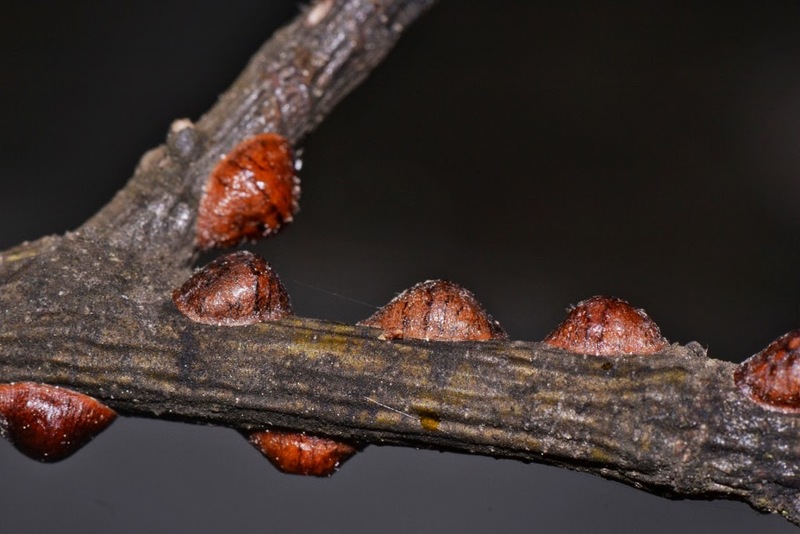 This batch of scale insects have mostly sucked their last sap. Now they are full of eggs... remember my photos of all those eggs that poured forth when I peeled off one scale insect? 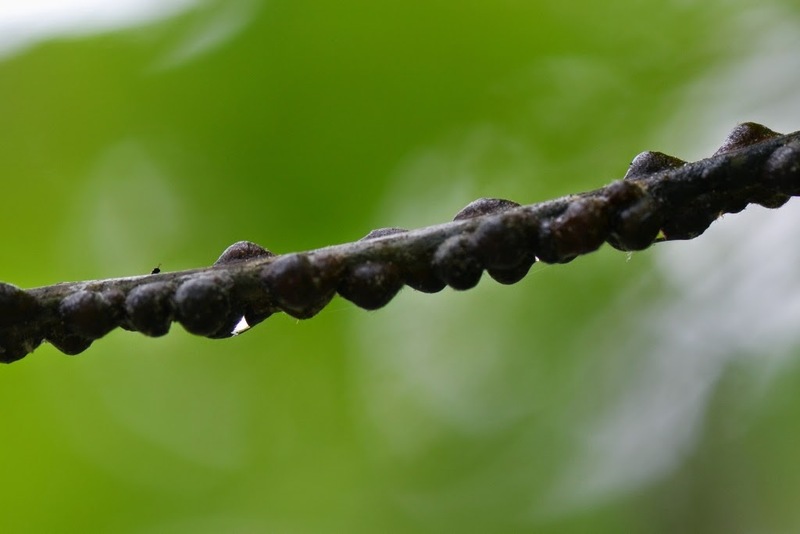 Think about each one of these bumps on a branch containing, what, thousands of eggs? Can you imagine what it will be like when all those eggs hatch? 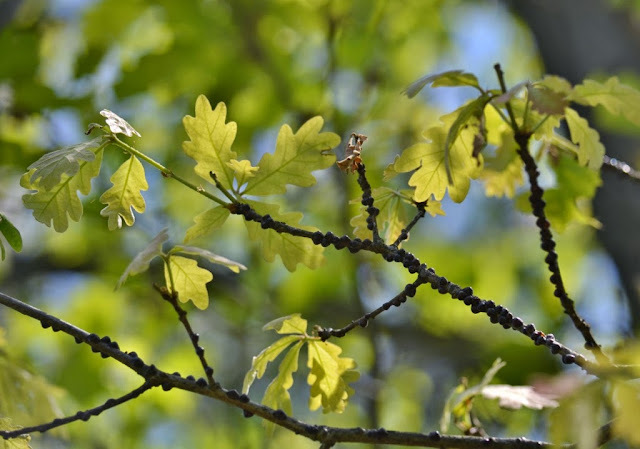 Imagine what will happen when the eggs hatch from all those scale insects which are crowded on almost every oak (and hickory) branch in this forest? Who is with me in hoping that many of those scales have been parasitized? Which side is going to win the battle? Are the scale insects going to increase a thousand fold next summer, or will their natural enemies be able to keep them under control? Will the bio-control agents bust up the bivouac on the branches enough that next year the scales will less of a factor in the forest and thus escape attention from the outdoor folks? I'll keep tabs on these scale insects and their enemies and I'll post more about them later on this summer. Wow. You can guess which side I'm rooting for. Go, wasps, go ! Parasitoids Wasp's are the best!!! I found the same thing on my tree but it's not a oak tree, nor are they brown, they are black and white. Do you know anything about those? There are many kinds of scale insects... tell me more about the scale insects you have and the tree they are on. OMG thank you so much! This is exactly what I was looking for. I cannot wait to check out the other pages on your site!! Your photos are amazing! Great pictures. Thanks for taking them and posting! The scale is in some trees on Massachusetts Avenue in Washington DC, and a city has lots of willow oaks! Worrisome!